Acupuncture – A health therapy technique that simulates specific points of the body by inserting extremely fine needles. Acute pain – A pain that is short lasting. Bursitis – When the fluid filled sacs that are positioned over joints, called bursa, become swollen and inflamed. 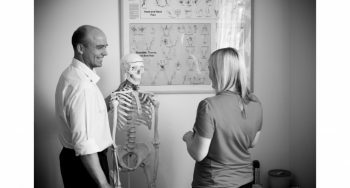 Chiropractor – A practitioner of the area of medicine that treats the misalignment of joints. Coccyx – A small triangular bone at the base of the spinal column. Chronic – A pain that is long-lasting, generally considered to be in excess of 6 months. Golfers elbow- A pain caused by inflammation of the tendons that connect the forearm to the elbow. Hot rock therapy – Heated rocks are placed along specific areas of the body to soothe tired sore muscles and stimulate circulation. Ligaments – Fibrous tissue that connect bones or cartilages together. Lumbar – Refers to the five lumbar vertebrae. Generally regarded as the lower part of the back. Lordosis – Excessive curvature of the spine. Massage – The rubbing and kneading of muscles and joints to relieve tension or pain. Nerve – A group of fibres in the body that send impulses to the brain or spinal cord. Posture – The position and shape that someone holds their body in. Podiatry – The care and treatment of the human foot. Pilates – Exercises and stretches that are designed to strengthen the core muscles of the torso. Scoliosis – A medical term that refers to spinal curvatures. Scoliosis is a condition that almost always begins in early childhood. And it is exceedingly rare. In fact, only about 5 out of 1,000. Spinal column – The collective term for the bones of your back. It acts as protection for the spinal cord and allows the body to flex and bend in various directions. Tendons – Flexible cords of collagen that attaches tissues to the bone. Vertebrae – A series of small bones that form the backbone. Whiplash – An injury caused to the neck by a severe jolt-like movement.